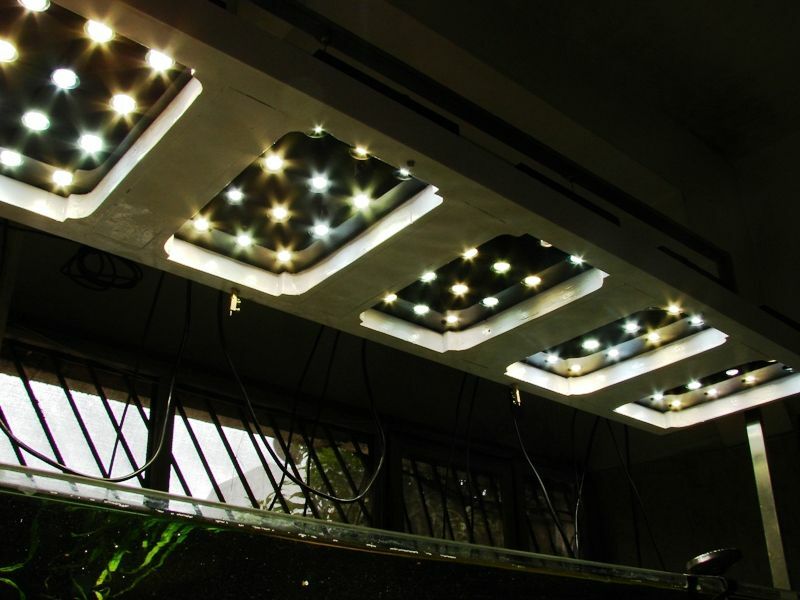 indianaquariumhobbyist.com Forums » Post 300635 » Re: PK's LEDs up and running on my tank ! http://indianaquariumhobbyist.com/community/ :: View topic - PK's LEDs up and running on my tank ! PK's LEDs up and running on my tank ! Posted: Thu Jul 26, 2012 10:56 am Post subject: Re: PK's LEDs up and running on my tank ! Sorry for the delay, here are the pics. LEDs mounted on a custom made PCB for planted aquaria. Parallel connection ports for power and control. Heat sink and cooling fans. Modular Panel, the smaller slots are for a regular stereo jack and through the controller. The larger ones for from the Power module. I'll add a couple more pics once I fix this back in place. Had the remove everything just to post pics. Posted: Thu Jul 26, 2012 1:24 pm Post subject: Re: PK's LEDs up and running on my tank ! Also is there a way we can connect the ph meter with this system, to some kind of switch. so that we can control the solenoid valve on the CO2 cylinder. Posted: Thu Jul 26, 2012 2:39 pm Post subject: Re: PK's LEDs up and running on my tank ! All 12 LEDs ON per panel at 90% output. hole for the jack and output to a solenoid for CO2 control. Posted: Thu Jul 26, 2012 4:40 pm Post subject: Re: PK's LEDs up and running on my tank ! Very nice setup Madan. A photo of the tank taken in evening/night would look even more better. Do post some pics if you have taken any. Posted: Thu Jul 26, 2012 5:04 pm Post subject: Re: PK's LEDs up and running on my tank ! Posted: Thu Jul 26, 2012 5:35 pm Post subject: Re: PK's LEDs up and running on my tank ! Looks nice madan, Like the white acrylic frame. Did you get it done in bangalore or chennai? Posted: Thu Jul 26, 2012 6:15 pm Post subject: Re: PK's LEDs up and running on my tank ! Posted: Thu Jul 26, 2012 6:24 pm Post subject: Re: PK's LEDs up and running on my tank ! just wondering on one point, as to how the heat is getting transferred onto heatsink? the PCB doesnt look to have any vias, is its in contact just behind LED? Posted: Thu Jul 26, 2012 7:14 pm Post subject: Re: PK's LEDs up and running on my tank ! Sai, The LED is stuck on the heat sink with special glue/sticker. There are holes cutout on the PCB for the LEDs. Even after 6 hrs at 90% output the Panel is not even warm. Shelly, my lights go off at 5:30 PM. I am not reprogramming that for a picture. Arjun, the white acrylic frame is actually made of thin packing wood. Posted: Sat Jul 28, 2012 5:21 pm Post subject: Re: PK's LEDs up and running on my tank ! Is it possible for a few more closer pictures of the hood ? Posted: Sun Aug 05, 2012 6:34 pm Post subject: Re: PK's LEDs up and running on my tank ! Clicked with my P&S camera in ambient light. The Lights! See the color difference? The Spectacular tank. "Work in progress" here too. More plants are still to be added. Just imagine how will it look at night! Posted: Sun Aug 05, 2012 7:43 pm Post subject: Re: PK's LEDs up and running on my tank ! Posted: Sun Aug 05, 2012 11:39 pm Post subject: Re: PK's LEDs up and running on my tank ! that combo is looking very good on tank. what are the dimensions of one unit which has 12 LED's ? also on the return pipe of canister(i suppose) is a eductor attached,, did you procure it locally ? what is your take on it ?? Posted: Mon Aug 06, 2012 2:02 am Post subject: Re: PK's LEDs up and running on my tank ! What optics are you using ? Posted: Mon Aug 06, 2012 7:39 am Post subject: Re: PK's LEDs up and running on my tank ! Pls suggest on correct distance to be kept between water surface and LED fixtures.